Coverage: Live on BBC One, BBC Radio Scotland, BBC Radio Wales, BBC Radio Cymru & BBC Sport website and BBC Sport app, plus live text commentary. Wales full-back Leigh Halfpenny says his three-month absence with concussion was "difficult" and "unpredictable" to deal with. 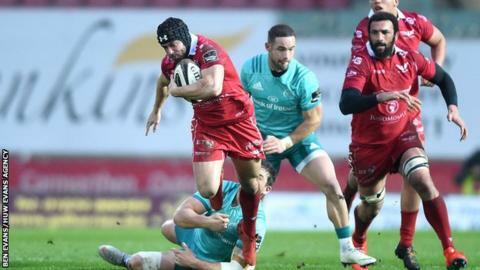 Halfpenny has played twice for Scarlets since his return, after suffering a head injury against Australia in November 2018. The 30-year-old has been retained in Wales' Six Nations squad and is in contention to face Scotland on 9 March. "The head is all good now," said Halfpenny. The British and Irish Lions full-back's comeback was delayed on several occasions as he suffered further symptoms following his injury. Halfpenny eventually returned in the Pro14 victory over Cheetahs in February before playing a starring role in the 10-6 win over Munster. He was defensively solid and made the break for the only try of the game, but admitted he has suffered some difficult times. "It is great to be back and I am loving being back on the field with the boys," Halfpenny told Y Clwb Rygbi. "It has been a difficult couple of months and it was not the best of injuries. "It was quite difficult to deal with at times and a bit unpredictable. "The head is all good now and it was great to get another 80 minutes under my belt and be out there with the boys." Halfpenny has played down an immediate Test recall against Scotland after full-back Liam Williams was named man of the match against England. "We will see what the selectors go with, but looking at the boys there they have been outstanding," said Halfpenny. "That game against England was awesome. "There is a great feeling in camp and it is a massive game at Murrayfield for this tournament. "So it's an exciting week ahead for the squad." Wales are waiting on the fitness of Wasps flanker Thomas Young who picked up an injury after playing for Wasps against Leicester on Saturday. Young has not linked back up with the Wales squad after picking up a hip problem which forced him off the field after only three minutes in Wasps' 19-14 defeat at Welford Road. "He seemed to get a nasty knock up at Leicester and he is recovering at Wasps at the moment," said Wales defence coach Shaun Edwards. "We are in contact with them over his progress." The 26-year-old did not feature against France or England but started in the victory over Italy.